You may remember that Kalvin had a blog for some years. This shot is from an entry he made on September 10, 2008. Unfortunately, the site was neglected and eventually hacked and I had to shut it down, but now I’m wondering if I should make an effort to restore it. Do you know who the others are? I think a couple of them are his kids, but I’m not sure. I agree with Amy. Restore it. It may do Kevin some good to be able to write on there again. I’m beginning to doubt we’ll ever see Voon on line! So far, I guess he’s shown no interest. He may not remember what “online” is. Or, only have a vague recollection of it and isn’t sure what he’s suppose to do. Give him time. Melissa said 6 months to a year before we know the full extent of his recovery. Who knows what next week will bring. Some time in the future, please restore it. I’m going on long term disability soon and hope to be able to afford internet service again in the near future. Things are tight right now but I’m hoping to find an additional revenue stream in the future. I have moved all my albums to my home from storage so maybe I can piece together an online show. I also want to start taking photos again. I’m working with a dizziness doctor and will know in the next couple days what my future is. I’ve undergone testing all week. BTW: the 2 closest to me are my boys, Matt and Robby. The Viking fan is one of Rob’s high school friends, Eric Sowder. 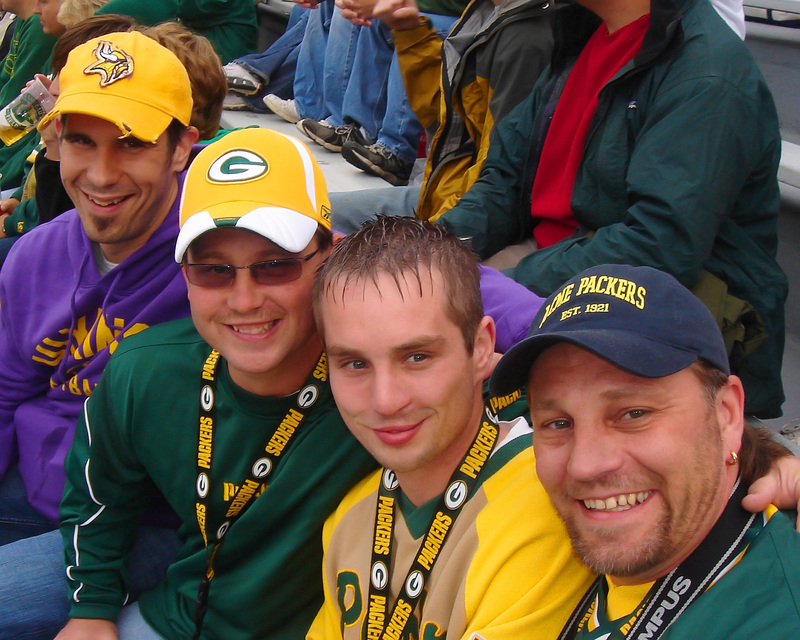 This was taken at a Packer/Viking game in Green Bay.